Oh...My...Word...we're going to be on Netflix! 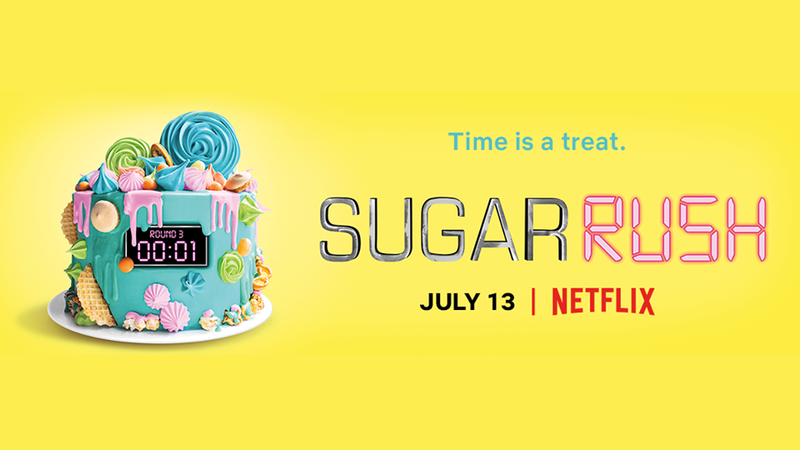 WHAT: Sugar Rush is a brand new baking competition show with three round elimination. This show has four teams of two, competing for a Grand Prize of $10,000! WHERE: Watch this show through Netflix streaming! Watch it over and over if you'd like! WHEN: The show airs July 13th! Team Sweetness will be on FB live during our 4:30(PST) viewing. If you are in the New England area, go to HPBC for a viewing on the big screen with some of our most favorite people! Event begins at 6:30PM (EST) with show premiere at 7:30PM(EST) *We will be live during festivities prior to viewing. We are so glad you will be attending the Sugar Rush viewing party to support Team Sweetness! Please let us know if you have any questions. WHY: Well, we were asked by the producer if we'd be interested in competing on a new baking show and we said yes! After a somewhat lengthy application and interviewing process, we were asked to participate. WHO: Want to know who the winner is? We can't tell you! But we can say that this was an incredible experience. The production company was absolutely amazing to work with. The competitors were not only incredibly gifted at their craft, but they were all wonderful people to share this experience with. Sometimes you see people behaving rudely and quite nasty during competition shows...not this group. So...be sure you catch us live on FB at 4:30PM (PST), and be sure to join the crowd at HPBC for the viewing if you're in the area. Feel free to ask us for more details about that.